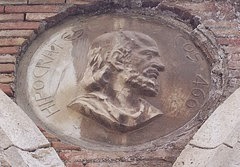 Hippocrates (460 B.C-377 B.C. ), born in Kos, Greece (the second largest island of the East Aegean Sea), and died in Larissa, Greece. He was the father of rational medicine, a physician, teacher of the art of healing and a philosopher. From him came the fundamental principles of the medical practice which is diagnosis based on observation and logical reasoning. He founded the medical school of Kos where the students were taught that disease has natural causes, to understand human suffering one must be at the patient’s bedside, i.e. in spite of his interest in disease in general, the first objective of a physician was to pay attention to the patient and to comfort him. From this attitude the “Hippocratic Oath,” to benefit the sick, is derived prior to receiving a medical degree. Hippocrates refused to accept superstition, magic and supernatural explanations for disease. He was influenced by Egyptian, Assyro-Babylonian, Mesopotamian, Phoenician and Minoan (Cretan) civilizations and by ancient Jewish medicine especially in the fields of sanitary laws, prevention and prophylaxis. Hippocrates believed in the four humors and maintained that health was the balance or harmony of them while disease was the imbalance (see Galen). Disequilibria was caused not only by this but also by the influence of the environment, seasons, weather, nutrition, diet and other factors. Treatment was the attempt to restore this balance. Finally, he maintained that a physician also had to be a philosopher. He was the first to note that 60% of visits to physicians were due to psychological factors. Today, many doctors maintain the same. In short, he is an ancient pitch against the witch. It was thanks to the Muslim conquest of Spain that Hippocrates and Galen’s teachings came to Spain and from there were carried to the rest of Europe. Hispano followers included Avenzoar, Averroes, Avicena, and Maimónides.